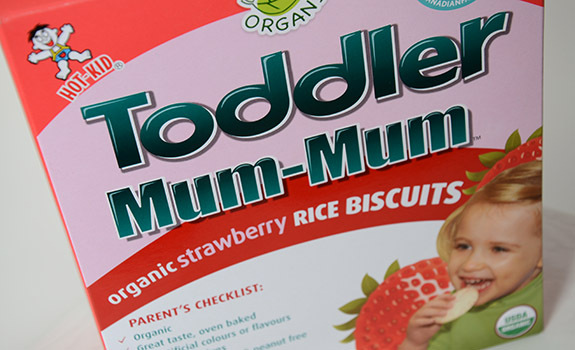 A box of Toddler Mum-Mum Organic Strawberry Rice Biscuits. There is a world of toddler treats beyond Arrowroot. Don’t believe me? Allow me to introduce you to Toddler Mum-Mums, a light, airy rice cracker “biscuit” made with organic ingredients and, in this case, flavoured with strawberry. They’re already a staple in our house. The Pitch: Features a “parent’s checklist” that includes: organic; great taste, oven baked; no artificial colours or flavours; no preservatives; gluten, lactose, egg & peanut free; low in fat and no trans fat; no added fats or oils; each serving individually wrapped for convenience. The Look: As much as that checklist tries to ease the minds of worried, socially conscious parents, there’s a lot of bulky packaging here. There’s the box (recyclable), there’s the inner clear plastic pouch (recyclable, I’d think), and there’s the foil-plastic packaging for each set of two biscuits (not recyclable, at least where I live). 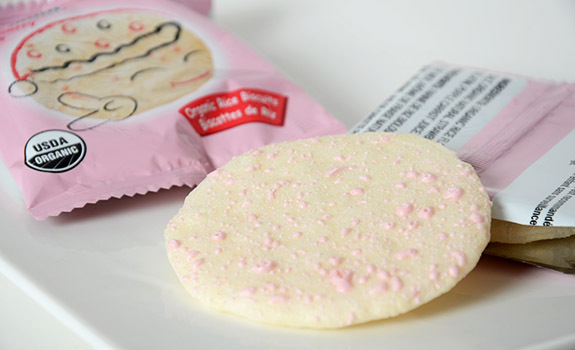 The biscuits are circular white discs covered with small pink flecks stuck to one side. They’re odd but cute looking. The individual packages each feature a quirky illustrated cartoon version of a biscuit that varies from unit to unit. The Taste: It’s the flavour crystals that make these taste like something more than crisp, neutral air. The strawberry is reasonably natural-tasting, but not very strong; I’d call this a good trait in a food aimed at kids, even though I’m less impressed as an adult. The texture is very dry and brittle, with a definite (and satisfying, especially to a wee one) snap when broken. It turns to mush as soon as it hits moisture, be it from drool-covered hands or while chewing in the mouth. Note the light pink strawberry flavour splatter marks on the top of these Toddler Mum-Mum Organic Strawberry Rice Biscuits? Other than these small bumps, the rest tastes like flavour-neutral mush. Cost: $3.29 for a 60 gram (24 biscuit) box at Calgary Co-op. Value for cash money: OK, I think. Nutrition? : Per 2 biscuits (5 grams): 20 calories, 0 grams of fat, 15 mg of sodium, 0 grams of fibre, 0.3 grams of protein. The verdict: Not bad. I prefer Arrowroots, but this is an acceptable alternative, especially when offered to daddy by a little person who wants to share.